With their win today over No. 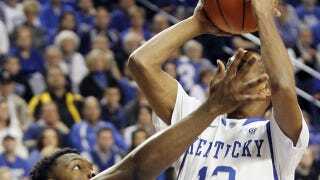 11 Florida, the Kentucky Wildcats will probably make the NCAA Tournament. Normally UK achieves that designation by late November or so. Kentucky missed the Big Dance in 2009, but it'd been 1991 since the Cats last weren't invited to March Madness. They hold the NCAA record with 53 appearances overall and 113 wins in the Tournament. They're the reigning national champs. Yet until the last 11 seconds of today's game, when the Gators missed a chance to tie, Kentucky was merely an optimistic bubble team. On Friday, coach John Calipari called the Florida game a "do or die" for his club. A loss to Florida would've put the Cats at 3-5 down the stretch into the SEC tournament. Instead Joe Lunardi has ‘em in his "last four in" category. They're a barely. They're looking at a double-digit NCAA seeding and perhaps, if they're lucky, a single tournament win. That'd be somewhat south of what Kentucky regards as its birthright, especially after last season, when Calipari appeared to have solved the new college basketball one-and-done landscape by embracing it in the most Machiavellian fashion possible. In 2012 his Cats were a precise cross between an all-star AAU team and an NBA all-rookie team, a band of babes who lost a single regular-season game by a single point and then vaulted from an SEC title game loss into a hellacious run through the NCAAs. They won their first two tourney games by 15 and 16 points, their next two by 12 apiece and their Final Four matches by 8 and by 8. It may suggest to an overall dilution of talent in the college game, but you gotta stand back and admire that feat by a starting lineup of a freshman center, a freshman small forward, a freshman point guard, a sophomore shooting guard and a sophomore power forward. Then, all of those underclassmen went to the NBA, as everyone knew they would. Calipari reloaded. And this seemed to be the way of things now. Juniors were old maids. Seniors were for losers. The winners in perpetuity would be NBA clearinghouses that declined to participate in the charade that dicking around in college is of any real use to players who are projected lottery picks. But it turns out the Coach Cal formula works if and only if you have other-worldly freshmen who play out of their minds for 40 games. Just as likely, if the 2012-13 season is any indication, you risk running a volatile program full of teenagers who are still, despite their ability, just tykes. Nerlens Noel was a defensive marvel worthy of Anthony Davis' mantle, but he, like Davis, struggled at times to score. Then he got hurt. Archie Goodwin has been solid, but there's just not enough of him to go around. In the words of ESPN blogger Eamonn Brennan, "Alex Poythress was as disappointing as any newcomer in the country." Kentucky struggles in all the ways you'd expect a young team to struggle: It's second-to-last in the SEC in free throw percentage, middle of the pack in scoring defense, doesn't shoot the three well and ranks last in the league in turnover margin. The Cats are a decent team, but not much more than that. Only one of its top seven scorers is an upperclassman. We might see Noel, Goodwin and Willie Cauley-Stein all bolt for the pros after this season, but then, we knew they were likely to be short-timers. Kentucky will take solace in knowing they've got a fresh new crop who could explode for 38 wins and a national title, if they click. The rest of the country is assured, though, that this piratical formula Caliparil is running looks much riskier than it did a year ago.